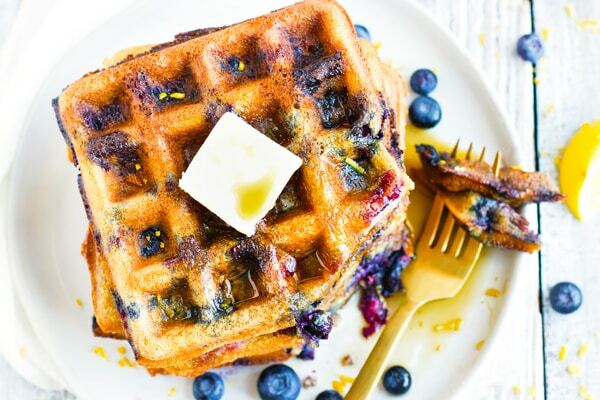 This healthy Lemon Blueberry Waffle recipe has a fresh citrus flavor and bursts of berry bliss in every bite! These Paleo waffles are also gluten-free, vegetarian, dairy-free, soy-free and freezer-friendly! Do you ever come across a word that when you say it three or four times begins to sound kind of weird? Let’s try this one out here. Try to say “blueberry waffle” 5 times in a row. Doesn’t the word waffle start to sound strange? Almost as if you must be mistaken that it is really a word?! Ok, enough of my fascination with the word waffle, let’s get down to this blueberry waffle recipe!! Perfectly “Springy” Paleo Waffles for the New Season! The changing of seasons is always so refreshing to me. Not only does the weather begin to shift, but so do the foods we eat and enjoy. One of my all-time favorite combinations to enjoy during the Springtime is lemon and blueberries. 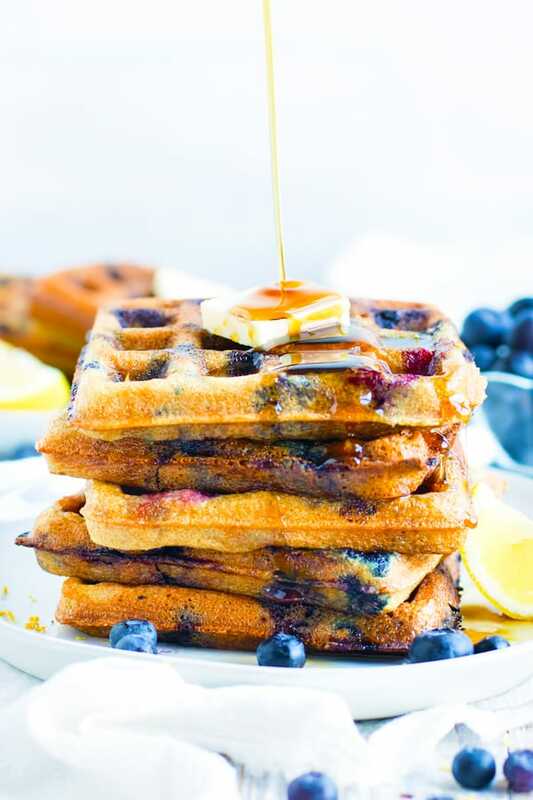 Whether eating a healthy lemon blueberry muffin or scarfing down a stack of these lemon blueberry Paleo waffles, you can’t ever seem to go wrong when you combine these two flavors. Is this Gluten-Free Waffle Recipe Healthy? There are absolutely no grains used! Instead, nutritious almond flour replaces the bulk of the flour. The waffles are completely refined sugar-free. Coconut sugar is used to replace regular sugar. You’ll find no gluten, dairy, or soy in these bad boys, either! What Kind of Waffle Maker Do I Use? Recently I purchased one of my new favorite kitchen gadgets… a Cuisinart Belgian Waffle Maker! In less than 5 minutes I have four perfectly cooked, square Belgian waffles to enjoy. One of my favorite features about this Belgian waffle maker is that you can adjust how well-cooked you want your waffles. Simply watch for the light to go off and you know your waffle is perfectly cooked! 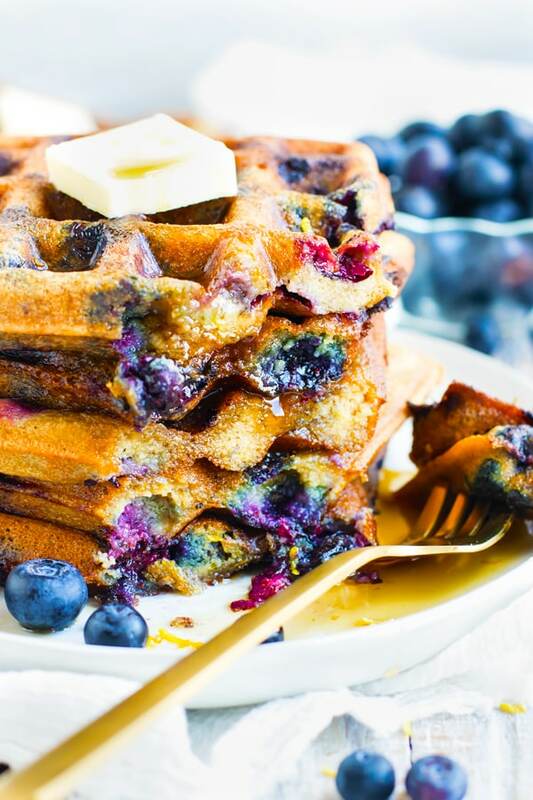 How Can I Evolve this Paleo Lemon Blueberry Waffle Recipe? Feel free to substitute chia seed eggs or flax eggs for the regular eggs. Not a fan of coconut milk? You can use almond, soy, or cashew milk instead. Is lemon not your jam? Simply leave out the juice and zest, and they will still turn out great! 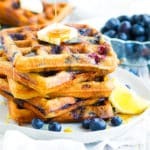 This Lemon Blueberry Waffle recipe has a fresh citrus flavor and bursts of berry bliss in every bite! This Paleo waffle recipe is also gluten-free, vegetarian, dairy-free, soy-free and freezer-friendly! In a large bowl whisk together almond flour, tapioca starch, coconut sugar, and baking soda. Add almond milk and butter. Mix until just combined. Add eggs, lemon juice, vanilla, and lemon zest. Mix until just combined. Lastly, fold blueberries into the waffle batter. 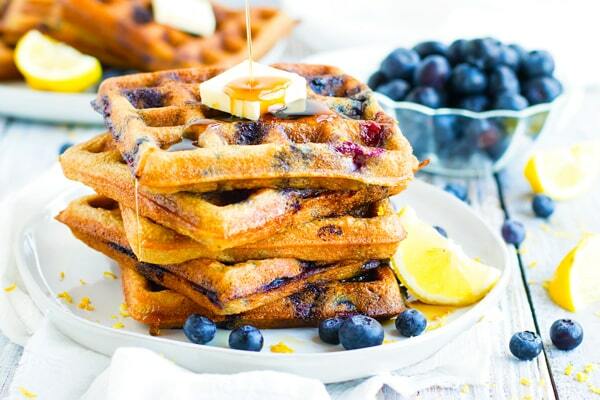 Serve lemon blueberry waffles with maple syrup, coconut whipped cream, or blueberries and enjoy! *Waffles freeze well and will last for 4-6 months if packaged and frozen properly. 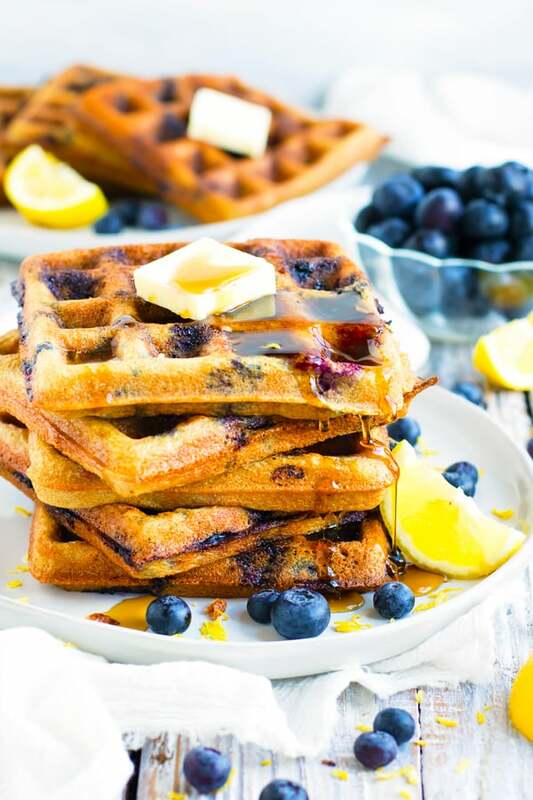 Want more recipes like this Paleo Lemon Blueberry Waffle Recipe?